The water levels in the Mekong River’s upstream are increasing, the National Centre for Hydro-meteorological Forecasting said on August 11. On August 10, the highest water level was 3.49m on the Tien River, a main tributary of the Mekong River, as measured at the Tan Chau monitoring station in An Giang province. The water level was 1m above Emergency Level 1. It was at 2.89m on the Hau River, another tributary, as measured at the Chau Doc station in An Giang, 0.11m lower than Emergency Level 1. The water levels are predicted to rise to 3.85m on the Tien River in Tan Chau and 3.25m on the Hau River in Chau Doc on August 15. The respective levels may hit 3.9m and 3.3 metres on August 20. 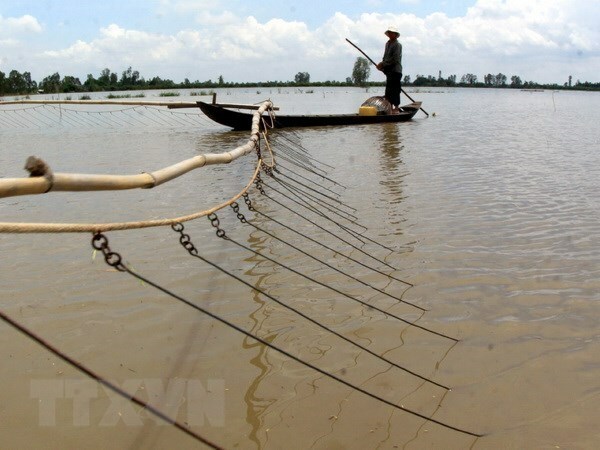 The Central Steering Committee for Natural Disaster Prevention and Control has instructed the Mekong Delta provinces to keep farmers informed about weather and tide conditions so they can harvest crops unprotected by dyke systems. To minimise losses caused by rising water levels of the Mekong River, local authorities have been helping farmers to upgrade dykes and drain water from rice fields.